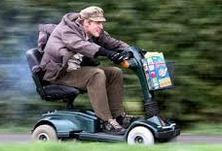 It is important that you ensure that you purchase the right mobility scooter for your needs. Consider the type of journey and how far you expect to go on your new mobility scooter. Is it likely to be a short journey close to home on a flat surfaces or long journeys over bad pavements or rough ground? Do you need to transport your mobility scooter in a car to take with you on holidays or is it to be used as locally going to and from the shops? Your body size and weight is also important when you choose a mobility scooter. Three, four and five wheel mobility scooters and lightweight folding buggies are available. Find suppliers selling mobility scooters and buggies in this section. Ensure you receive the correct advice before buying your scooter. Ableize provides very powerful website promotion of all manner of disability and mobility products and services, if you would like to promote your mobility scooters and buggies in this busy and popular section then check out our incredibly comprehensive prices by clicking the Submit Your Site button at the top of the page to include your mobility scooters site and any Facebook or Twitter pages to receive increased hits and sales. Discover a truly folding light weight mobility scooter from Luggie with a range of models available from a dedicated UK supplier. View video clips and details of a no hassle free home demo along with real reviews from happy customers. MobilitybatteryStore are an online service offering a full range of batteries to fit most electric wheelchairs and mobility scooters. Enjoy next working day free delivery services to many parts of mainland UK. Registered disabled can claim back the VAT from us by filling in a simple online form. Buy your batteries online today. Monarch Mobility are one of the UK’s leading suppliers of mobility equipment, including mobility scooters, rise and recline chairs and stair lifts. View their full and exciting range to meet all disability needs. Also offers free no obligation home demonstrations and expert advice. Call Monarch Mobility on 0808 102 2218 today. Lincolnshire mobility dealer highlighting their selection of new and pre-owned mobility scooters and accessories. Includes 4 and 8 mph scooters in a range of sizes. Highlighting the range of mobility scooters for disabled and elderly use available from Sunrise Medical. Includes details of three and four wheeled models including easy to transport scooters.